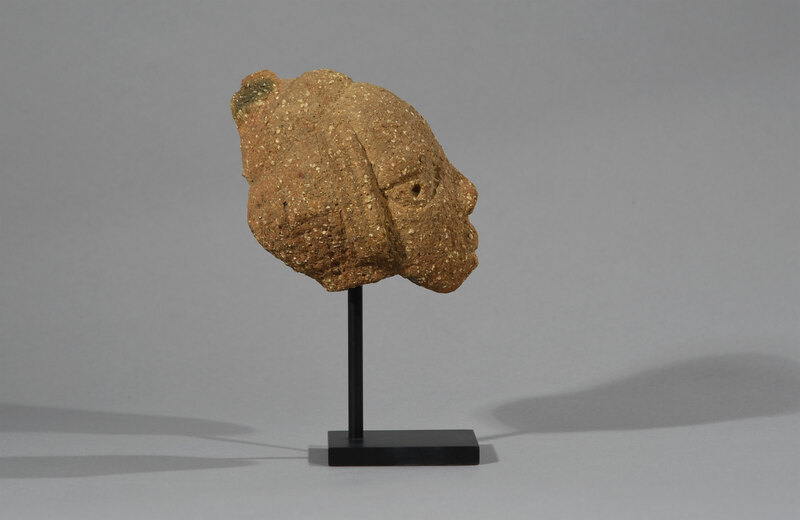 This little ‘Nok’ terracotta head was found in a village about 160 kilometres northeast of Baro in Nigeria in1947 and est. to be from around 500 BC. till about 200 AD. Notice the decorative and classic little head with slanted, walleyed drilled eyes under arched eyebrows (which are often seen in later groups such as the Yoruba), a wide lipped mouth, the snub nose is broad and flat –unlike the majority of pieces that have a more aquiline or elongated nose – and the ears are covered by hairstyle form sideburns. 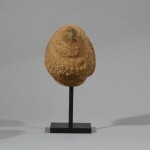 The head is mounted on a custom-made stand. The earliest identified Nigerian culture is the Nok culture, which thrived between 1500 BC and 200 AD on the Jos Plateau in northeastern Nigeria. Information is lacking from the first millennium BC following the Nok ascendancy. However, by the second millennium BC, active trade routes developed from Ancient Egypt via Nubia through the Sahara to the forest. 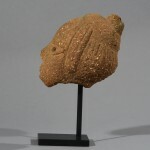 Savanna’s peoples acted as intermediaries in exchanges of various goods. Reasons for the Nok’s sudden disappearance remaines unknown. Most Nok sculpture are hollow and coil-built like pottery. 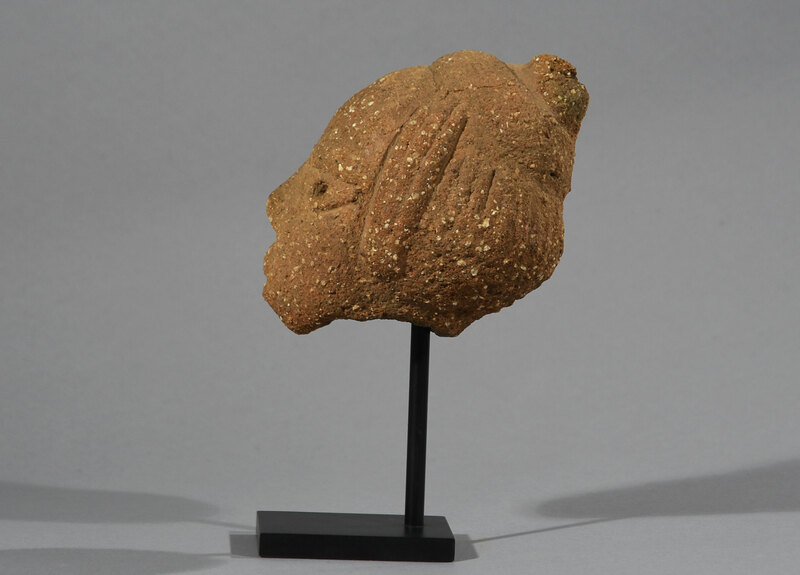 Finely worked to a resilient consistency from local clays and gravel, the millennia-long endurance of these ancient objects is evidence of the technical ability of their makers. This is not to say that Nok sculpture has survived unchanged by time. 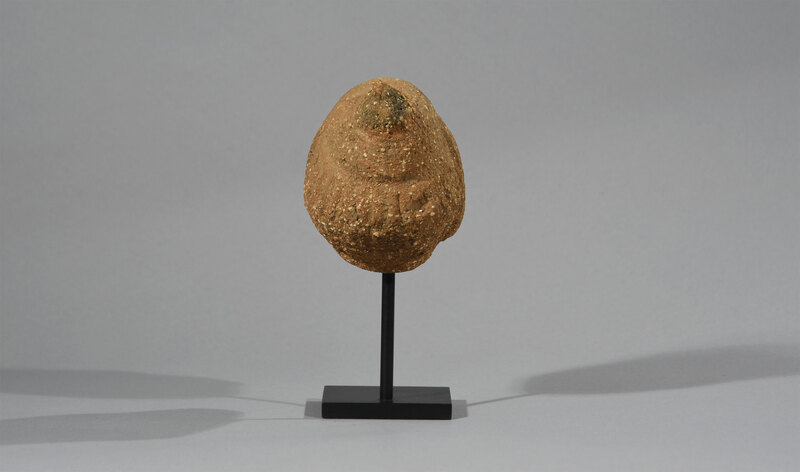 The slip (the mixture of clay and water used to give pottery surfaces an even texture) of many Nok terracotta has eroded, leaving a grainy, pocked exterior that does not reflect their original smooth appearance. 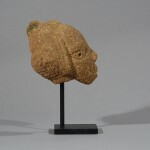 Most of the Nok sculpture found consists of what appear to be portrait heads and bodies fragmented by damage and age. The recovered portions of the baked clay bodies that have survived show that they were sculpted in standing, sitting, and genuflecting postures. Although every Nok head is unique, certain stylistic traits are found throughout the corpus of known work. Triangular eyes and perforated pupils, noses, mouths, and ears combine to depict men and women with bold, abstract features. 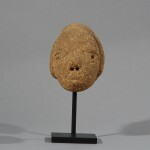 Perhaps the most striking aspects of Nok sculptures are the elaborately detailed hairstyles and jewelry that adorn many of the figures. The variety, inventiveness, and beauty of their design is a beguiling record of cultivated devotion to body ornamentation. 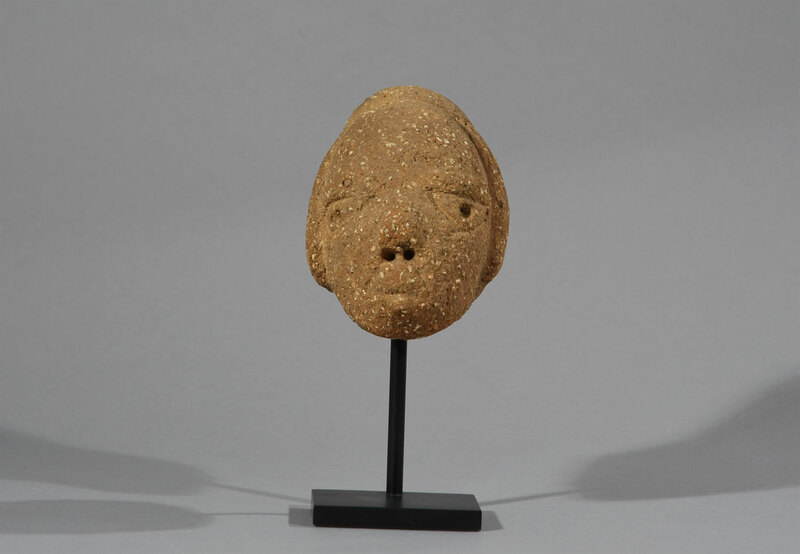 But as captivating as these embellishments are, the range of expression in Nok terracottas is far from limited to depictions of idealized health and beauty. Some pottery figures appear to depict subjects suffering from ailments such as elephantiasis and facial paralysis. 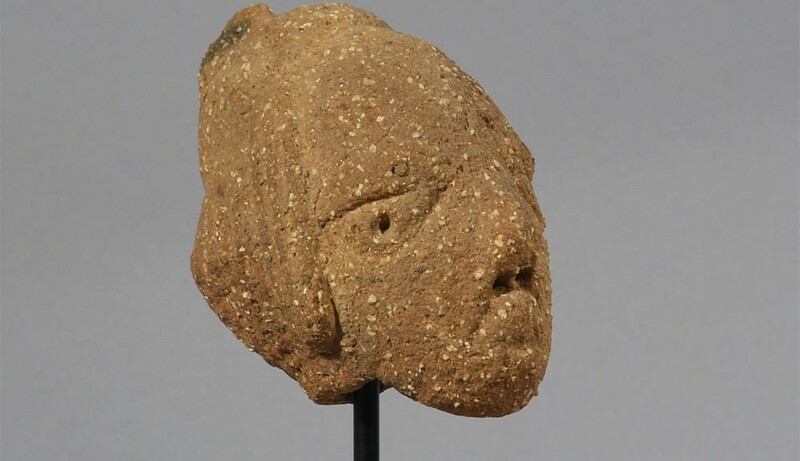 These “diseased” visages may have been intended to protect against illness but, beyond conjecture, their meaning and the significance of Nok sculpture in general remains unknown. Dimension: H: 13 cm (21 cm incl. stand), W: 10 cm, D: 14 cm.